SKU: SJG-10. Category: Lock Picks. Brands: SouthOrd. Used by many locksmiths, repo men, tow truck drivers, and car dealerships. Auto jiggler lock picks open many foreign and domestic cars and trucks. Jiggler style lock picks are also called profile lock picks, tryout keys, or automotive master keys. 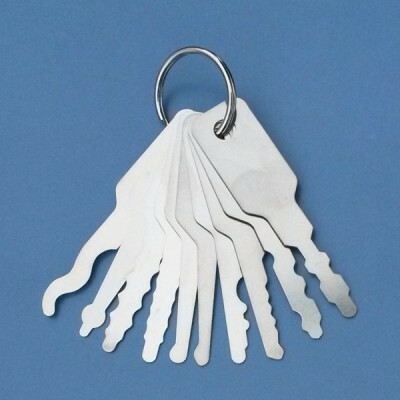 These lock picks work alone and do not require the use of a separate tension tool. Simply insert one of these picks into the lock and apply a light turning force and rock the lock pick up and down. The lock will open when the key profile is found that closely matches the profile of the actual key. 10 piece set. Manufactured from full hard spring stainless steel.